What’s this? A whiff of inflation? Startup facilitates breakups… a matter of timing… reader denounces us for advocating zero interest rates (?! )… and more! “God’s work” ain’t what it used to be. Six years ago, Goldman Sachs CEO Lloyd Blankfein got a bit too full of himself, saying his firm was “doing God’s work.” And what was that, exactly? Well, that’s what investment bankers used to do. What’s more, their firms were structured as partnerships. So it was their own money investment bankers were putting on the line when they helped companies raise capital. But that was more than a generation ago. Then the economy became “financialized.” The investment banks became publicly held companies. The executives became hired guns. And with the exception of the sacrificial lamb Lehman Bros., the losses from any blunders they make are covered by the American taxpayer. It was Goldman that turned this extractive model into an art form. By 2007, as the housing bubble was ready to burst, Goldman was selling mortgage securities to clients without disclosing an important fact: The only reason those securities existed was that hedge fund king John Paulson wanted to short the hell out of them. Goldman go-getters would send each other internal emails bragging about the “sh**ty deal” they just made. But Goldman made a deal with the devil to emerge unscathed from the Panic of 2008. And the bill is coming due. As you might recall, Goldman converted to a bank holding company. For the government’s purposes, it became a garden-variety bank — even though it doesn’t have branches or serve people who want open a plain ol’ checking account. Converting to a bank holding company was the only way Goldman could have access to the Federal Reserve’s discount window — a lifeline during the worst days of the financial crisis. But bank holding companies are subject to more regulations than the go-go investment banks of the 1990s and early 2000s — especially under the 2010 Dodd-Frank Act passed to (theoretically) prevent another 2008 meltdown. These days, Federal Reserve regulators stalk the halls of Goldman, sapping its profits: Returns on equity were north of 20% a decade ago. Now? Only 10%. No wonder Warren Buffett is looking for the exits. Yesterday, Berkshire Hathaway disclosed it trimmed its stake in Goldman by 13% during the third quarter. The official explanation was that Berkshire had to raise cash to fund its acquisition of the aerospace-equipment maker Precision Castparts. “I’m surprised he had to sell anything to fund the Precision Castparts purchase, with over $60 billion of cash on his balance sheet,” University of Maryland professor David Kass tells Bloomberg. Buffett acquired his Goldman stake during the 2008 crisis on, ummm, exceptional terms. He plunked down $5 billion in exchange for preferred shares paying a 10% dividend… plus warrants to buy another $5 billion in shares. Goldman later redeemed those preferred shares and Buffett renegotiated the warrants to pick up regular shares in a cashless transaction. But with Goldman’s return on equity slipping, Buffett clearly sees better opportunities elsewhere. What’s it to you? Jim Rickards and his team have just identified a way to play it — with up to 200% profit potential over the next year. Rickards’ Strategic Intelligence readers got access to this “tactical” opportunity just today — a thoroughly researched opportunity applying a technique Jim’s been refining since 1981, now available to you. Follow this link for access. Major U.S. stock indexes are drifting up, adding to yesterday’s gains. The S&P 500 is up more than a half percent, at 2,065. Wal-Mart and Home Depot both delivered decent earnings numbers. The Federal Reserve might be starting to get the inflation it desires — judging by the October consumer price index. The number jumped 0.2%. Year over year, the increase remains 0.2%. But if you strip out food and energy — the “core” rate — the year-over-year increase is 1.9%. And that’s for a second month in a row. Still, this isn’t the Fed’s preferred measure of inflation. That’s something called “core PCE,” and it’s still sluggish. The other big economic number of the day is industrial production — down 0.2% in October. But that’s a touch misleading. Manufacturing looks strong in this report; it’s utilities and mining that dragged the number down. Crude rose after we went to virtual press yesterday, but it’s sinking again today. At last check, a barrel of West Texas Intermediate fetched $40.91. 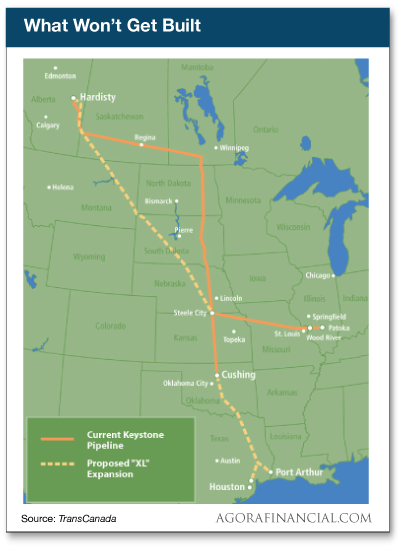 “Don’t think in terms of U.S. energy ‘independence’; think in terms of U.S. energy ‘security,’” says Byron King — weighing in on President Obama’s decision to nix the Keystone XL pipeline extension from Alberta down to the U.S. Gulf Coast. Beyond policy, who stands to gain from the decision? “If U.S. refineries don’t import Canadian oil sand bitumen, they’ll import ‘heavy’ oil from Venezuela instead,” says Byron. “So Venezuela’s national oil company Petroleos de Venezuela (PdVSA) benefits,” says Byron, “as does Venezuela’s communist-oriented government, which pulls a large takedown from PdVSA. Gold is sinking to new 5½-year lows at $1,068. And only part of that move can be chalked up to dollar strength. The dollar index is up to 99.7, and the euro is down to $1.063 — a seven-month low. The Breakup Shop’s target market is people who can’t bring themselves to convey the news in person that they’re calling it quits with their boyfriend or girlfriend. You can have it done for $10 via text message… $20 via form letter… $30 via a custom letter… or a phone call for $29. If you want rush service, you can pay extra. A writer from Vice tried out the service with his girlfriend — she knew beforehand it was a prank — just to see how it would work. The Breakup Shop, however, saw fit to embellish the story — accusing Angela of pressuring Emanuel to marry her. Oy… can’t anybody do anything face to face anymore? “Hi, there — I like this e-blast daily!” writes a new reader. The 5: Everyone gets The 5 at the same time regardless of where in the world he or she lives. On a good day, once we perform those tasks, run the issue through copy editing and have it coded for email and the Web, it goes out the door around 1:30 p.m. Eastern. We seldom have a good day… Heh. “It seems to me you guys are pulling for this poor policy of low interest rates to continue,” a reader writes. “Not I. “I, for one, am sick of the savers (older fixed-income folks) getting a good screwing from the banks by not receiving any interest on their money. We have a minimum wage, and we should have a minimum interest rate in this country. The 5: Huh? We’re as fed up with “the punishment of savers” as you are. We denounced what we called “the $470 billion swindle” last spring — Swiss Re’s estimate of how much American savers lost in interest income between 2008-2014. The number is surely higher now. Nor do we buy Ben Bernanke’s self-serving implication that if rates weren’t as low as he kept them, the economy would be far weaker than it is. Now, it’s true, Jim Rickards says if the Fed were to raise rates now, it would set off a firestorm of defaults in emerging-market debt — a firestorm bound to blow back on U.S. shores. But that’s not an endorsement of zero-interest rate policy in general. In fact, Jim says the Fed missed its chance to start raising rates in 2010-11 — when the economy was better equipped to handle them. As for “loans for Main Street”: Main Street is tapped out. Main Street is still recovering from the debt it accumulated during the first few years of the 21st century. Main Street has no desire to borrow at any rate. Consumers are trying to pay down existing debts, and small business says credit is the least of its problems — using the National Federation of Independent Business’ monthly surveys as a yardstick. What’s the Kissinger Cross? Well, for one thing, it’s how Jim and his team sussed out bad news coming for Goldman Sachs — as noted above. Jim shows you just how it works — and how you can use it to fatten your retirement account — when you click here.